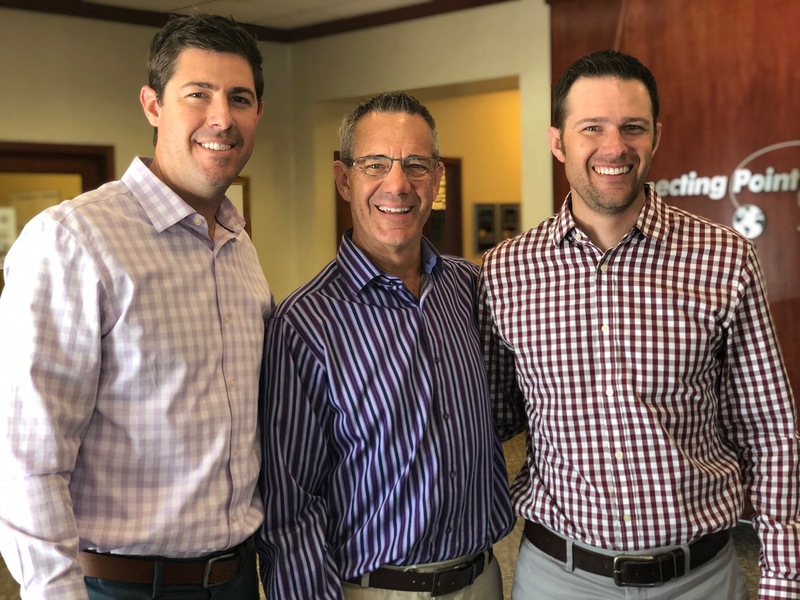 Brothers Scott and Andy Warner have taken over ownership of Connecting Point from their father, Ted Warner, the company's founder. Courtesy Connecting Point. Now, as their father transitions out of his role leading the company over the coming months, the brothers have left their seats and entered the game. Ted Warner said he began thinking about a succession plan a few years after Scott Warner joined the firm. The other option was to figure out a way to keep the business in the family. The two-year run-up to the sons taking over the business has “given me the opportunity to realize that I’ve got to start focusing on the next chapter of my life,” Ted Warner said. He plans to continue working for the company full-time until the end of 2019 and may consider continuing in a part-time capacity beyond that time frame as he shifts attention to other business ventures. Ted’s wife, Sue Warner, will continue to work as “director of fun” for the company, Scott Warner said. Over the years, Sue Warner has worked mainly part-time, handling bookkeeping, purchasing efforts, accounts receivable, and community and events coordination. The transition is a major one, but Ted Warner said it’s brought excitement to the company. Connecting Point began as a retail computer store in the 1980s, and at one point there were as many as seven locations. The arrival of big-box stores dried up mom-and-pop computer retail business, so Connecting Point pivoted toward the business to business network integration space. The business shifted again in the 2000s to become a managed IT service provider. “Our relationships with our clients are much more holistic than they were before,” Ted Warner said. Under Andy and Scott Warner’s leadership, that approach is not expected to change. Many business leaders assumed that as technology became ubiquitous in offices, IT support would become more and more commoditized, Scott Warner said. But the opposite has happened. Scott Warner predicted that the company will increase its focus on cloud services and hosted applications and infrastructure in the coming years. The company serves clients from southern Wyoming to the Denver metro area. Scott and Andy Warner said they have no immediate plans to expand the footprint of their service area, nor do they intend to retreat from the company’s role as a leader in the Northern Colorado business community. There is plenty of room for the company to continue to grow within its own backyard, the Warners said. Some may recoil at the prospect of running a business with a sibling, but not the Warners. Working in a family business brings its own set of challenges, but it also has a different set of rewards, Andy Warner said.